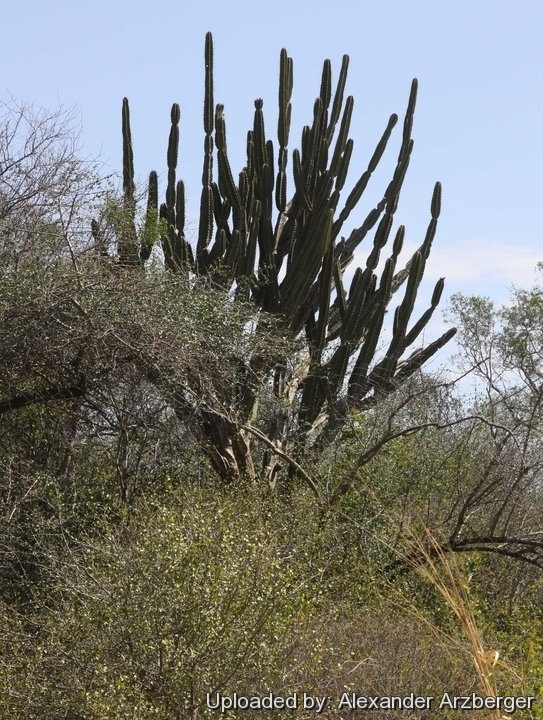 Origin and Habitat: Cereus stenogonus occurs in Argentina, in the provinces of Chaco, Corrientes, Formosa and Misiones, as well as in Paraguay ( Alto Paraguay, Caaguazú, Central, Concepción, Cordillera, Guairá, Paraguarí and Presidente Hayes departments) and Uruguay. Altitude range: This species can be found at elevations between 10 and 500 metres above sea level. 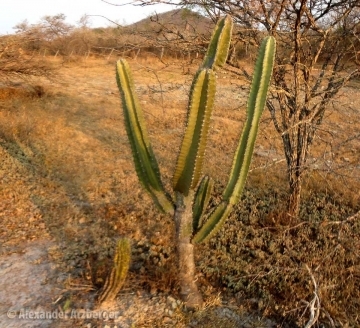 Habitat and Ecology: This cactus grows in sandy and clayey soils, in forest edges and as part of the scrub within low, subhumid forests together with Stetsonia coryne and Quiabentia pflanzii. It also occurs in rocky areas. Harrisia bonplandii, Harrisia martinii, Opuntia sulphurea, and Opuntia glomerata are also present in the understory. 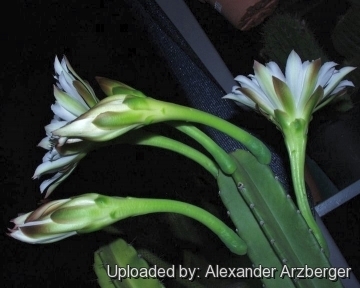 All of these cacti tolerate prolonged periods of heavy rain and saturated soil. 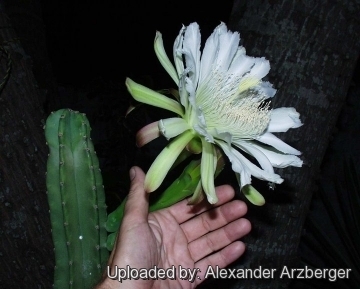 Cereus stenogonus is common and abundant throughout its range and there are no known threats to this species. 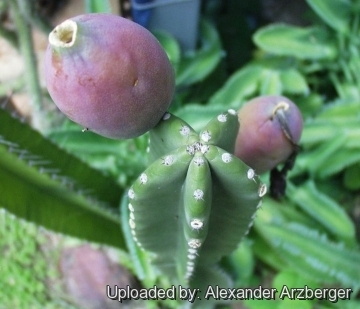 Description: Cereus stenogonus is a tree-like columnar cactus, with erect stems up to 6 to 8 meters high, much branched or nearly simple. Derivation of specific name: The epithe stenogonus Greek 'stenos', narrow, slender; and Greek 'gonia', corner, margin, refers to the narrow ribs. Stems: Cylindrical, bluish green, later yellowish green, 6-9 cm in diameter. Ribs: 4 or 5, very narrow, high and deeply notched. Areoles: Borne at the notches, widely separated. Spines: 2-4, short, conical, thick or bulbous basally, spreading, yellow with black tips or black the longest 5 to 7 mm long or subulate and the longer up to 4.5 cm long. Flowers: Large, pink to rose, 20 to 22 cm long, funnelform, the tube long and slender. Outer perianth-segments narrow, 7 to 8 cm long, mucronate, rose-colored or with rose-coloured margins. Fruit: Large, ovate, 10 cm. long or less, red or orange, with white or carmine flesh, unpleasant to the taste. 3) Pin, A.B. and Simon, J. “Guía ilustrada de los Cactus del Paraguay.” SEAM/GReB, Asunción. 2004. 4) Oakley, L., Pin, A. & Duarte, W. 2013. 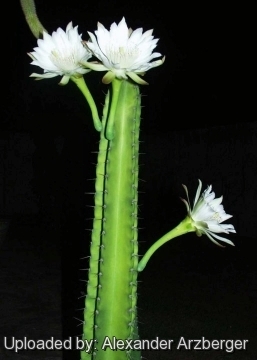 Cereus stenogonus. The IUCN Red List of Threatened Species 2013: e.T152697A667268. http://dx.doi.org/10.2305/IUCN.UK.2013-1.RLTS.T152697A667268.en. Downloaded on 26 June 2016. 8) Foster, R. C. “A catalogue of the ferns and flowering plants of Bolivia.” Contr. Gray Herb. 184: 1–223.1958. 9) Killeen, T. J., E. García Estigarribia & S. G. Beck. (eds.) “Guía Árb. Bolivia” 1–958. Herbario Nacional de Bolivia & Missouri Botanical Garden, La Paz. 1993. 10) López, J. A. & J. E. L. Little. “Árboles comunes del Paraguay” 1–425. Cuerpo de Paz, Colección e Intercambio de Información, Washington, D.C. 1987. 11) Nee, M. H. “Magnoliidae, Hamamelidae y Caryophyllidae”. 2: 1–209. In M. H. Nee Fl. Reg. Parque Nac. Amboró Bolivia. Editorial FAN, Santa Cruz. 2004. 12) Taylor, N. “Cactaceae of Bolivia: additional departmental records.” Cactaceae Syst. Initiat. 22: 10–11. 2007. 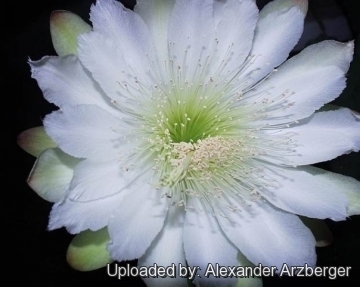 Cultivation and Propagation: Cereus stenogonus is very easy to cultivate, easy to propagate, tolerates light frost, and produces numerous showy white flowers 22 cm long. Growth rate: It grows quickly (a young plant will easily grow more than a 30 cm per year) and a plant grown in loose fertile soil with ample water availability may get up to 8 metres tall with dozens of branches.